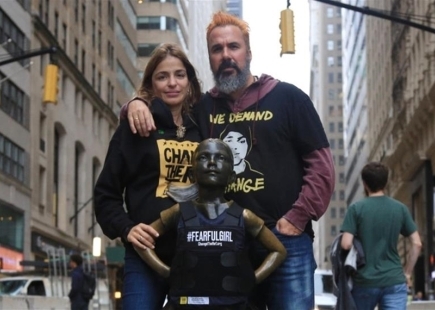 Since she first appeared in May 2017, a bronze statue by Kristen Visbal of a girl standing defiantly in a face-off with Arturo Di Modica’s bronze statue Charging Bull in New York, something irrevocable happened. 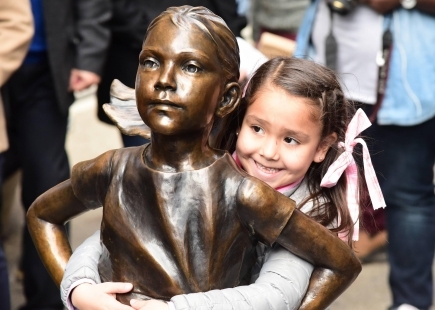 Fearless Girl changed the way we spoke about gender diversity in our industry – from Badass Girl launched by the young creative council, to the latest scandal to befall a legendary agency in central London. I’m not going to bore you with the background of the campaign, because, a simple Google search would suffice. The idea was to create a piece that would put pressure on companies to add more women to their boards. Following the installation of Fearless Girl by financial services company State Street Global Advisors, the company sent out letters to its partners to get them to diversify their boards. Following what seemed like a tsunami of activity on social media – the sculpture went viral. It got companies to sit up and listen. It caught the zeitgeist, which, in a twist of fate saw State Street Global in the hotseat when it had to pay $5 million in fines over gender discrimination claims. Since then, it has earned the company $7.4 million in marketing and reaffirmed the role of State Street Global as a formidable voice within the financial industry. So it is art? Is it commerce? Or an act of vandalism? The role of “real estate” or the “space” in which the work exists plays a narrative role in contextualising any piece of communication. 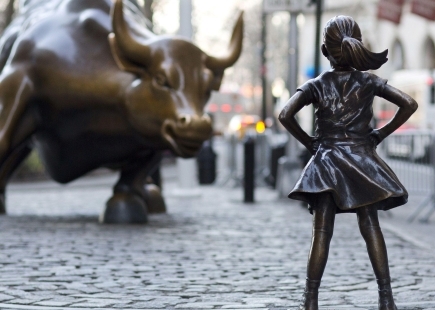 The media is the message – and placing a defiantly bold young girl in front of a “charging bull”, in New York city’s business district on International Women's Day was crucial to the success of this piece. She hijacked the limelight from most photographed public art in NYC and turned the street into a stage for gender equality in a post-Trump era. Charging Bull should be read for what it is, a symbol of hope for an economy recovering from the stock market crash of 1987. We should look at the pieces as actors on stage, playing off each other. If Fearless Girl is the challenger, she must be challenging a formidable symbol. In New York, the bull represents the financial institutions that have long since locked women out of the boardroom. Whilst in Norway, a copy of Fearless Girl has been placed defiantly facing off the parliament building – symbolically challenging the role of governance in gender inequality. 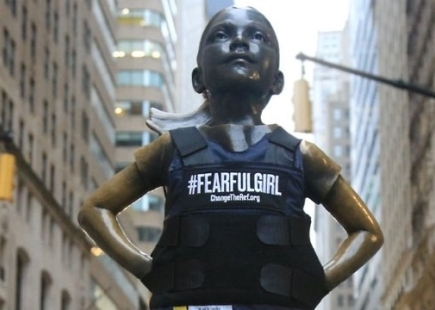 And just recently, the #FearfulGirl campaign showed the statue wearing a bullet proof vest, signifying that this girl can’t be fearless if she is afraid to go to school, highlighting gun violence. Fearless Girl and her message appears to remain strong whatever the cause with the message of strength ringing out loud and clear. One year on, Fearless Girl remains a piéce de resistance for women to stand up and say “enough is enough”. 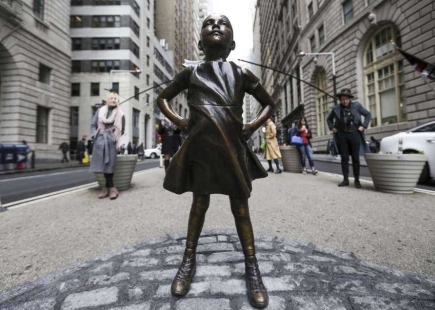 Fearless Girl started out as advertising, but transcended its original purpose and became public art. People now see her as part of the revolutionary aesthetic that marks the moment the world sat up and finally listened to the call for gender equality. Fearless Girl is just the start. 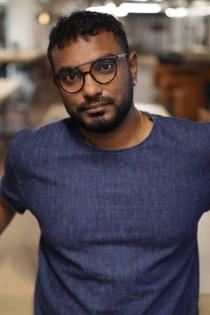 Brands and agencies should do more when it comes to gender diversity and diversity in general. 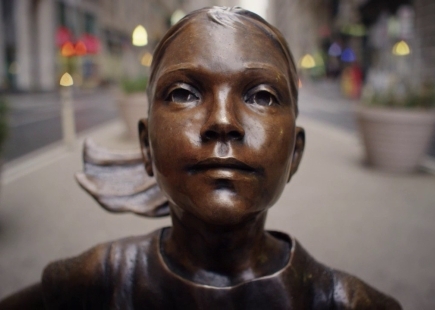 However, Fearless Girl is unquestionably the kind of girl I want to work with, and look forward to learning from. Lucky for me, I know a few.